To be honest, what would you expect from a car that comes from a factory based on Isle of Man? Power, speed, maybe some racing pedigree you might think. My today's subject has the origins in that place, but has no any single attribute from what I mentioned above. 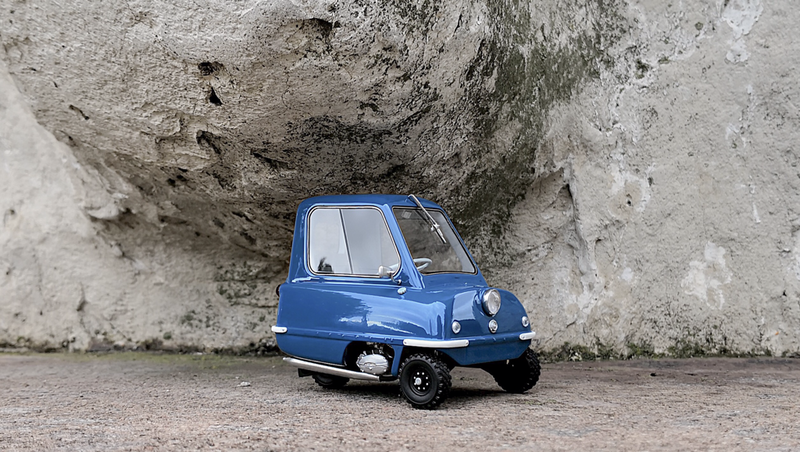 But, I can tell you is not an ordinary one, this car was listed back in 2010 in Guiness World Records as the smallest production car ever made. Only fifty pieces were made from 1962 to 1965 and now days only 27 are known to exist and few years ago during an auction one was sold for more than 100k USD at Sotheby's. 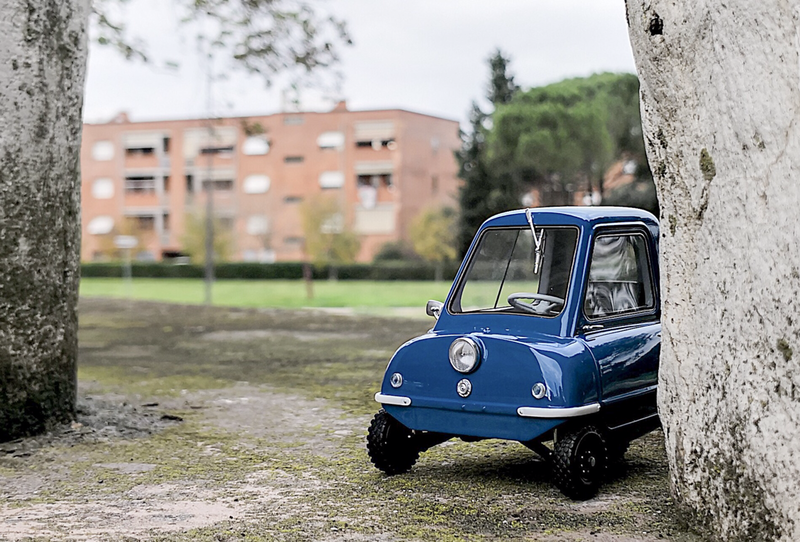 I'm speaking about the Peel P50 a 134 cm long car and only 56 kg described as capable to host one adult and a shopping bag. Who ever thought that someday this car would be replicated in 1:18 scale? Or better said who would ever have done that? Well, the team from DNA Collectibles already known about their originality in choosing their subjects, announced their intention few months back and now in the end of 2018 the model is almost ready to be purchased on their online shop. 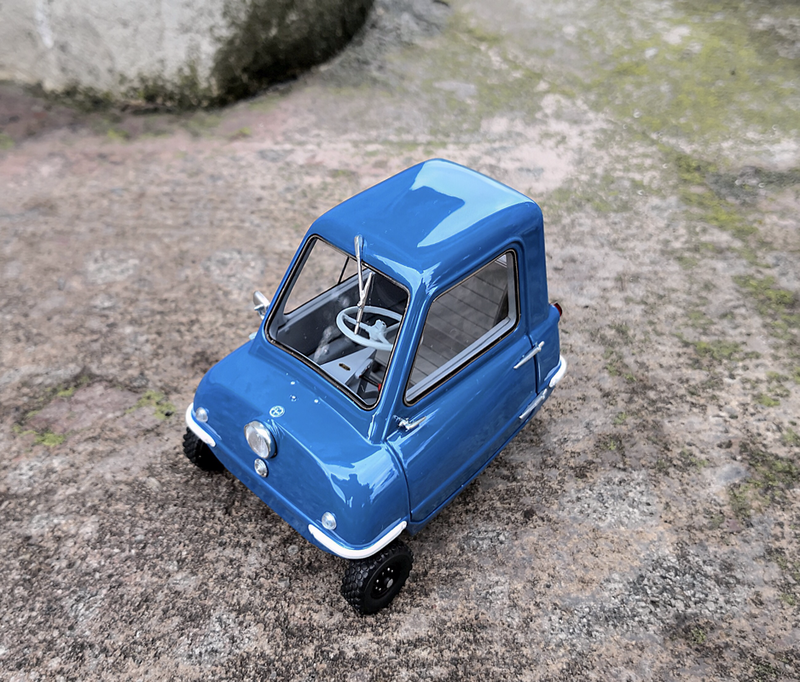 The team was inspired in replicating the Peel P50 by the Top gear's episode where this model was the main character of an original presentation. For this model the package and all the accessories that comes along with every DNA's model, was brought to a smaller dimension, but none of these prepared me to not be surprised when I put the model and its elegant clear base outside from the box. This thing is really small! If you don't know anything about the real one, you will be convinced that the model is a 1:43 scale replica. 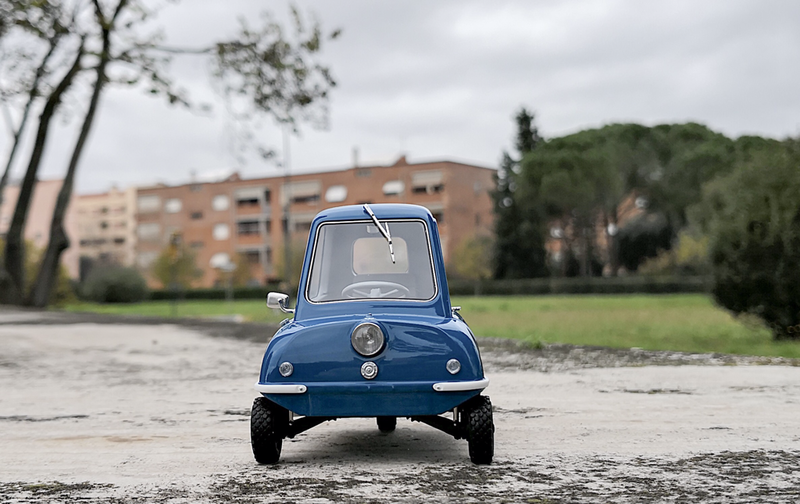 Is something very different, the little thing has character and was very nice surprised in scale by the manufacturer. Is very simple, may appear unfinished to many, but I assure you everything is there. The manufacturing is precise, sharp, well finished, DNA treated the subject very seriously and the result keeps further the brand tradition of great resin made replicas. The body is well moulded after the original design, the single left door keeps visible the shut lines, the external hinges and a delicate handle, developed as a single piece. 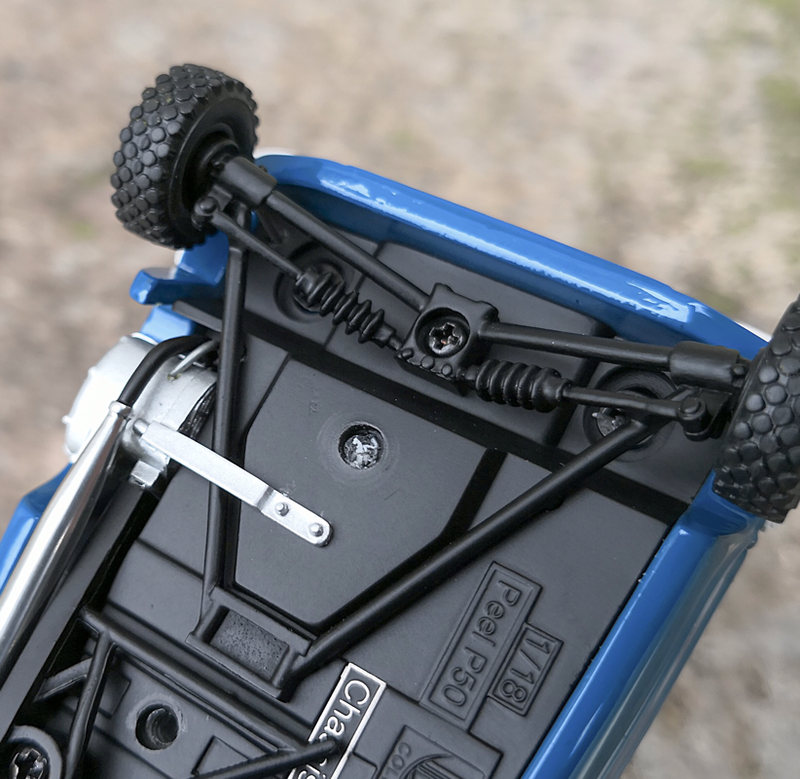 The bumpers are individual pieces as well, finished in a different color and keeping the fixing screw heads visible. 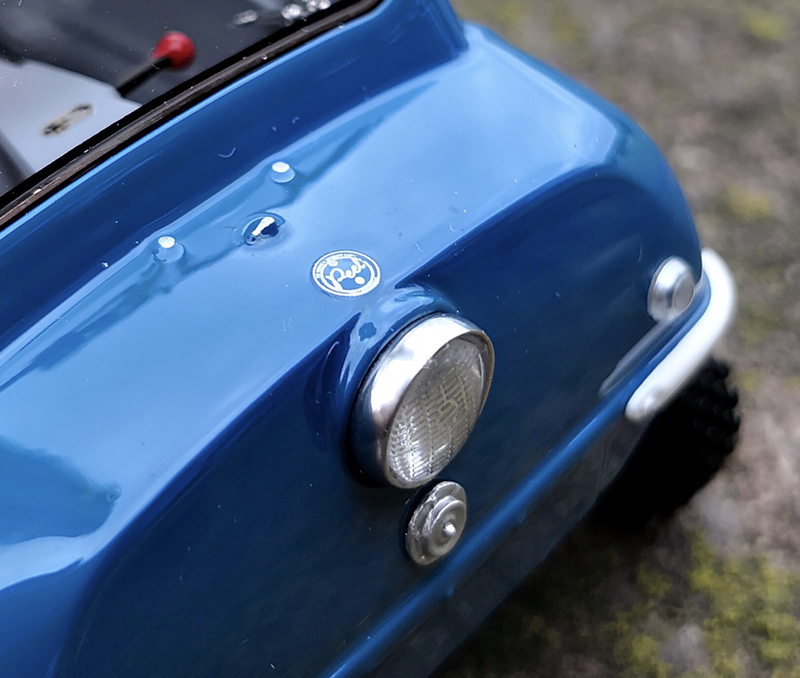 A lot of attention was put in making the little accessories like the front light, detailed with a chromed ring as the original and keeping visible inside, the light bulb. 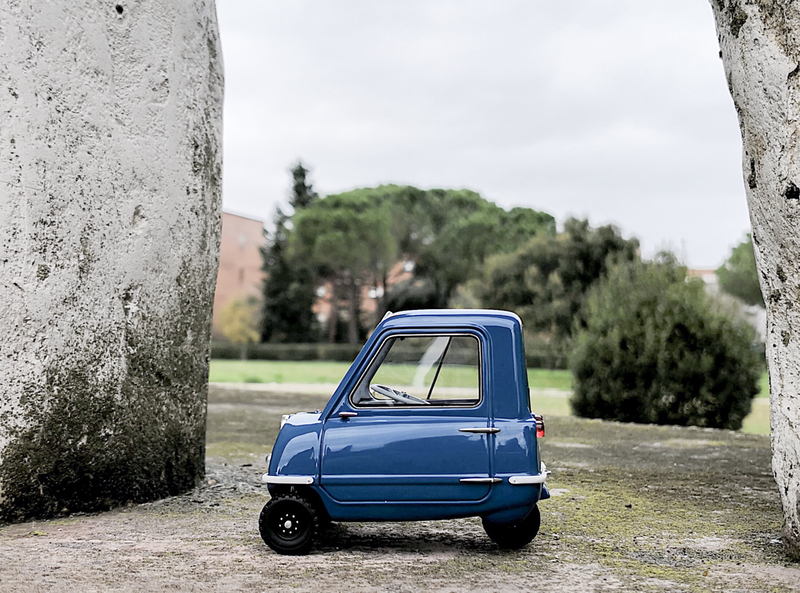 The fuel cap is a beauty, following the original shape and was even detailed with an inscription on its surface. 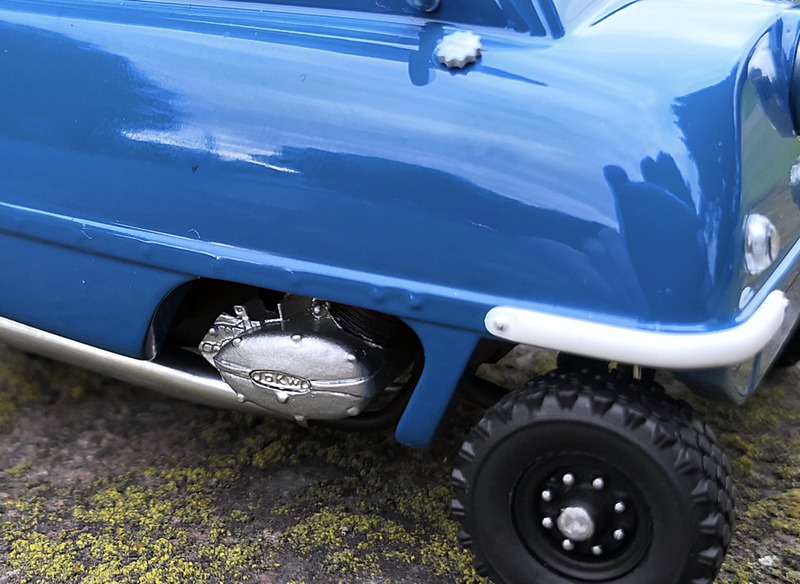 Everything is in place, well made and detailed, I will remember the external mirror, the lights, where the rear ones keep a beautiful and true to the real texture, when observed in strong light- pretty cool, to be honest- and not the least, the rear handle, used in real to move or park the car, since the P50 has no reverse gear. 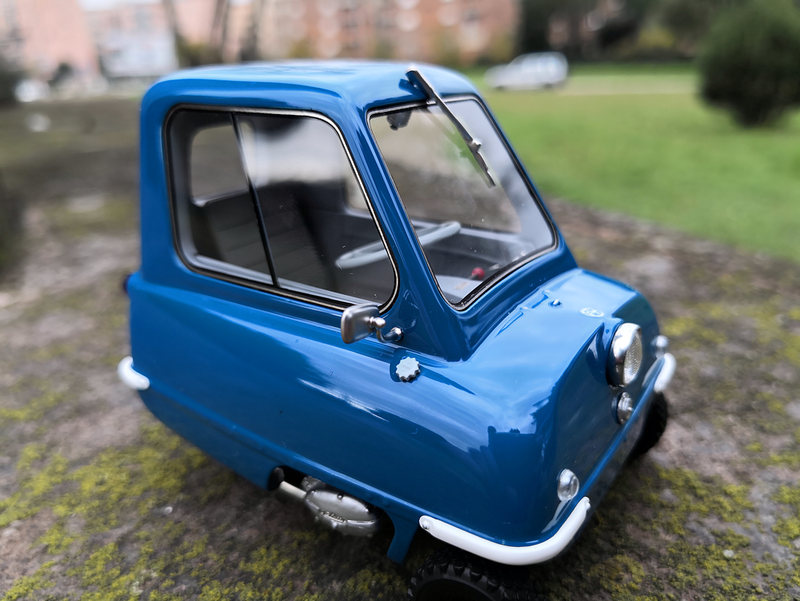 Is surprising to see how many fine details can be spotted on a few centimeters model and how they bring more value to the replica when are well made. Is enough to look at the subtile windows frame, beautiful chromed or the Peel lettering on the front side of the model, to understand this. 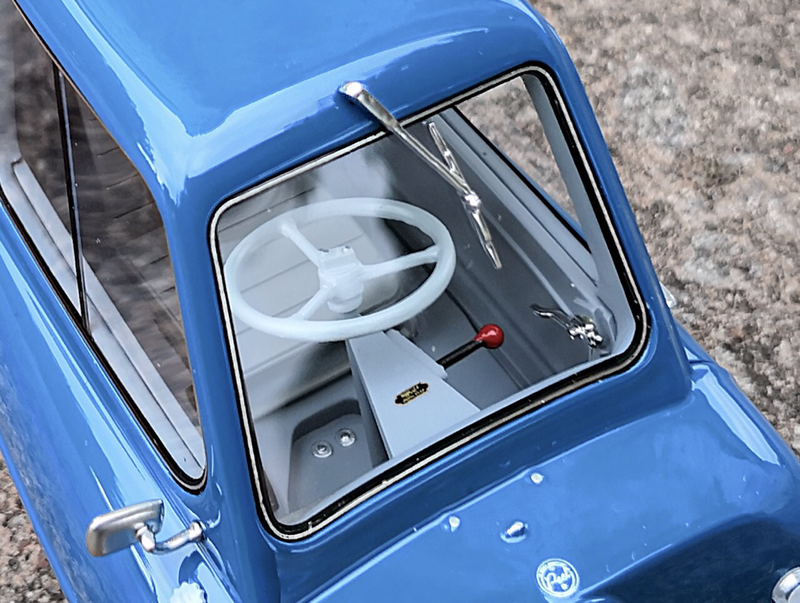 Same as on the real thing, our model was equipped with a screen wiper and a two pieces window on the right side. To have a great result, precision is very important, at least when we come to speak about the scale replicas and to understand how a minor detail can change everything, I invite you to observe on the right and front side the moulded rivet heads and how much realism they could bring to the model. I'm very happy the development team payed attention to every single detail. 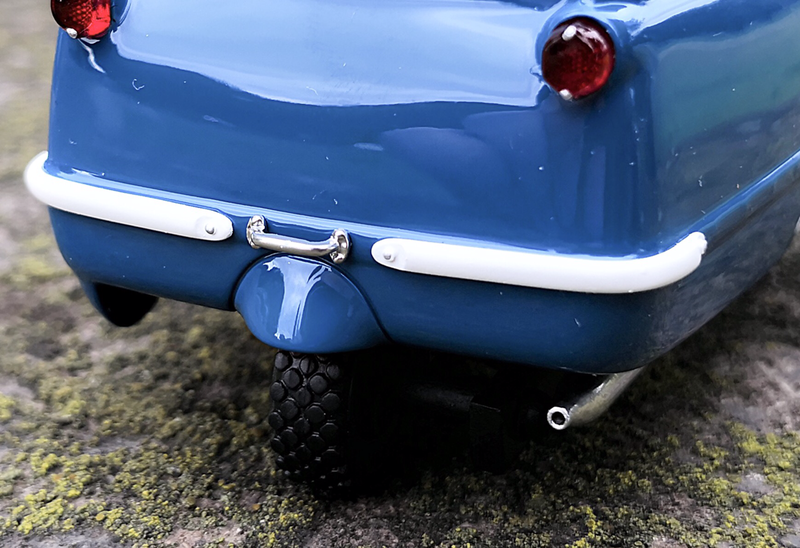 The wheels are simple, but are surprising by the number of studs for each micro wheel and the aggressive tyre's profile, more suitable for an off road car. 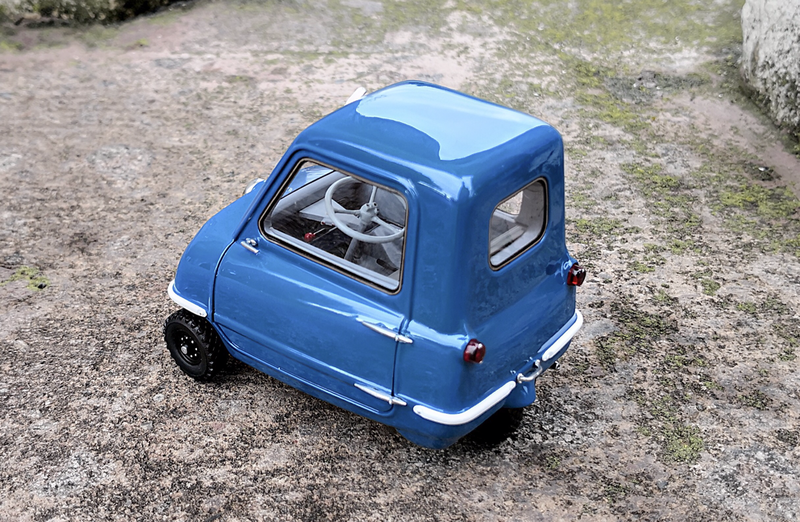 The 49cc petrol engine leaves on the right side, next to the front micro wheel and gives the opportunity to the development team to represent in scale an engine for the first time. Its shape and a few visible details are well made and if you'll turn your model upside down, you'll discover other details replicating the chassis structure and the suspension, where the metallic front dampers represent a very nice detail. Only the exhaust pipe, nice moulded, should be shinier if I report it to some photos of the real car. Let's move to the interior, where nothing goes over the limits of simplicity and on our scale model is extremely well finished. 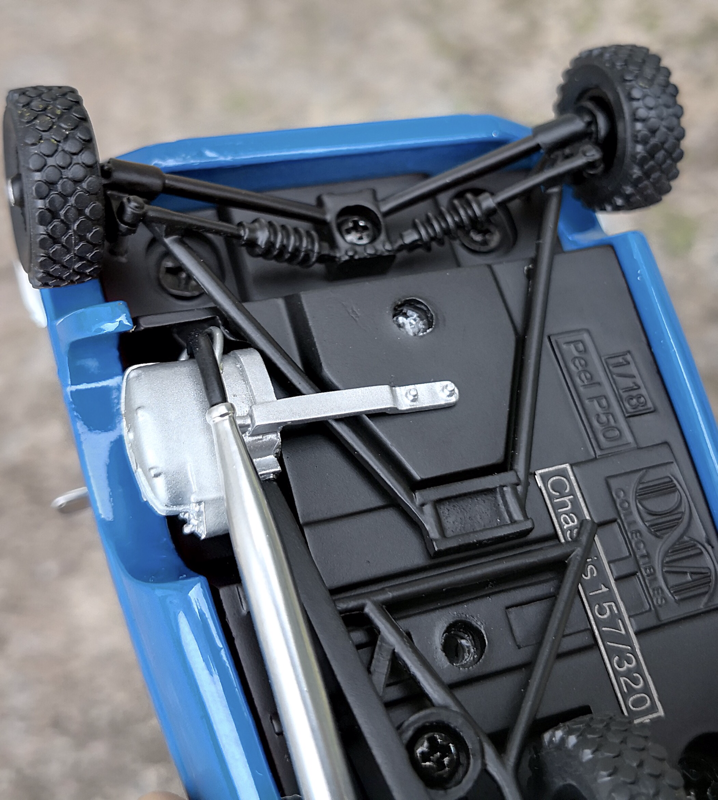 All the details from the real thing were correctly manufactured, even the right color for the shift gear head and on the floor the rivet heads from the engine frame. On what should be the dash board, a small plastic surface, is visible a label including some warnings or instructions maybe and I' m happy to find some details like a metallic photo etched part and some wires down there where the sight could miss them. 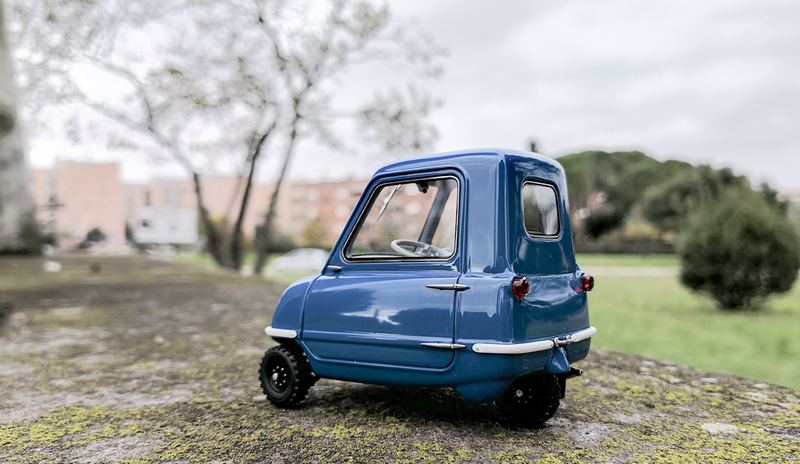 The privilege to see in real the smallest 1:18 model car and put my impressions in this article was a true fun. That little replica conquered me immediately and I still keep turning it over and over to discover more details or observe it from a different angle. 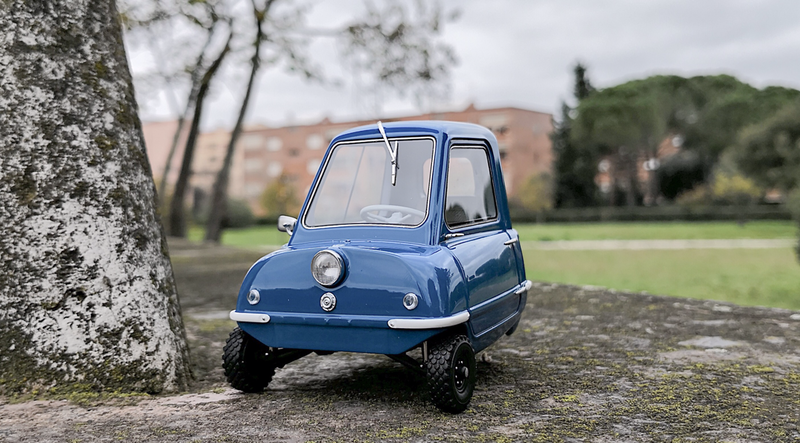 The simplicity was kept only in the original design, the manufacturing goes to the next level and having this car replicated is an opportunity to not be missed.